Wopo Holup is a New York based artist and has completed more than two dozen public art projects across the country. Holup's bronze and iron work can be found at the Philadelphia Zoo, Historic Battery Park in Manhattan, and the Tampa International Airport, among many others. Collaborations with architects, government agencies, and inspired communities have helped Holup to achieve her artistic goals. Articles and responses to Holup's work have appeared in Sculpture, Landscape Architecture, andThe New York Times. Drawings produced with Holup's projects have been shown in solo exhibitions at Mill Museum, National Park Service, Lowell, MA; Urban Culture Project, Kansas City, MO; Charles Schulz Gallery, Sonoma State Universite, Rohnert Park, CA; and the Center for Architecture, New York, NY. Her drwaings were also included in a traveling exhibit for The Center for Creativity and Design at the University of North Carolina. Yvonne Jacquette is New York and Maine based artist who began her career at the Rhode Island School of Design. Perhaps best known for her panoramic depictions of aerial landscapes of major cities nationwide, Jacquette has also illustrated books of poetry and designed sets. 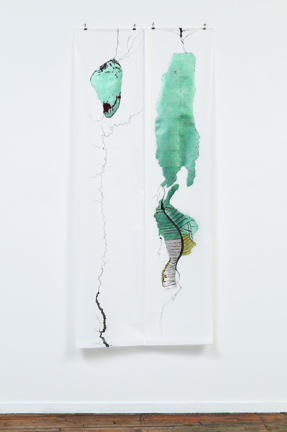 Her teaching experience includes the Moore College of Art, visiting artist at University of Pennsylvania from 1972-1976 and 1979-1982, Parsons School of Design from 1975-1978, Graduate School of Fine Arts at the University of Pennsylvania from 1979- 1984 and has been a visiting critic at the Pennsylvania Academy of Fine Arts since 1991. Jacquette had her first group show in 1962 and has been exhibiting steadily since. Her work is included in over 40 museums, with a number of public collections throughout New York City. Her work is held in the permanent colllections of the Museum of Modern Art, the Metropolitan Museum of Art, Whitney Museum of American Art, American Academy and Institute of Arts and Letters, and the Brooklyn Museum. Recent exhibitions include the Hirschhorn Museum and Sculpture Garden in Washington D.C. and in Staatliche Museum in Berlin, Germany. My drawings are about nature's flow -- its branching and dividing -- and the disbursements of energy. Rivers, traffic patterns, and cultural hierarchies are all forms of this flow. My public art projects are also about environmental systems. Drawings for the public art projects are made to illustrate and to clarify project ideas, and sometimes they spark ideas for an entirely new drawing series. The Concord drawing was started when I became involved in a public art project along that river. 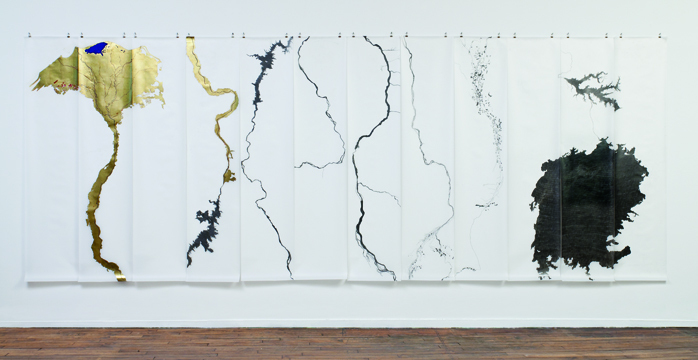 Segments of the river are drawn vertically on 84" x 18" paper panels to form linear patterns. The river itself is accurately scaled from a satellite view, but north/south and east/west directions are not. The drawing is centered on the Concord River and includes streams feeding it such as the Assabet and Sudbury Rivers. The Concord joins the Merrimack and then flows on to its final destination -- the Atlantic Ocean. The science of hydrology tells us that the Atlantic is not the end of the trip but just one step in the endless cycling of the earth's water. The metal leaf used on the drawings -- silver and gold, our most precious metals -- acknolwedge treasured sites such as the Nile, the Mississippi, and the almost mythological Sea of Galilee. Finding new views of these well-known places has been an exciting experience. I was drawn to the plant-like shapes in The Nile beginning with the northern irrigated valley "bloom" to the central river "stem" and finally the southern "root" at Lake Victoria. The Mississippi shimmers in silver ribbons from an airplane view and a satellite image shows man-made deltas competing with natural tributaries as the river flows into the Gulf. The sea in The Sea of Galilee is shaped like a human heart and it is connected by waterways to the Dead Sea -- the two seas like jewels on a river necklace. River Drawings evoke much more than that depicted. They imply views of the countries they inhabit: the surrounding mountains, hills, or plains that allow their meandering. 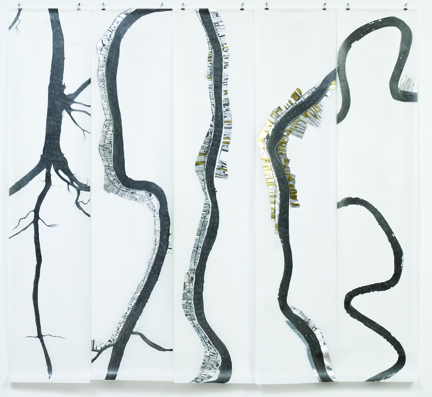 In these drawings the light coming through the mylar grounds are highly contrasted by the silhouette of each river's shape but even more by the specific materials used: gold leaf, silver leaf, graphite. The mylars were derived from other public projects yet further allude to the strength and elegance of nature.